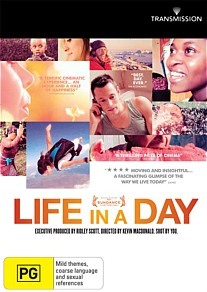 Life in a Day DVD Review. In the end, Life in a Day is a touching and mesmerising documentary about humanity at its most vulnerable, most powerful and how we fit into the bigger picture. Directed by Kevin McDonald (2011) of Touching the Void fame, Life in a Day is an inspirational documentary about the stories and emotions of everyday people from around the world. Produced by Ridley and his brother Tony Scott, with the brilliant direction of McDonald, they asked people around the world to film their lives and answer a few questions in order to create a snapshot of the planet on the 24th of July 2010. The results were outstanding. They received 4,500 hours of video from over 190 countries around the world which has been painstakingly edited to give us what is found on this DVD... a kaleidoscopic look of human life and existence. From the very first moments of this film, you immediately get drawn into this colourful world of emotions and more importantly, how these individuals, families, friends and strangers see the world from their point of view and more importantly, their own sense of being which is quite existentialist when all linked. From a woman who hears voices during the "Witching Hour", to a father and son who remembers their wife and mother by engaging in a daily ritual, Life in a Day is actually quite emotional at times. Certain scenes made me quite teary at times like the Australian man who just had a triple bypass, however other moments are quite uplifting and at times funny. The DVD also showcases the sights and sounds of the Earth as well from its landscapes to its wondrous animals. Apart from the emotional rollercoaster in this film, there is some remarkable cinematography as well, however the more powerful and raw footage is generally from those with more accessible technologies such as mobile phones. This gives their story a more humanistic touch and I must admit that I wasn’t really expected to be drawn into this film. The premise did sound interesting and I was optimistic at how they could succeed but somehow McDonald created a true work of art. In relation to the video, Life in a Day ranges from excellent to poor, however through the editing process, the transition from poor to good works well and it’s like some rich tapestry slowly unfolding with all its flaws. Given the content of the film, the video quality definitely does take a backseat, so don't expect to be blown away... although there are a few moments where this does happen and you think wow. Like the video, audio varies diversely and the only aspect of Dolby Digital 5.1 that is used is the musical score of Matthew Herbert who uses the sounds sampled from the various submissions to create a very emotional piece plus an orchestral backing. With over 4500 hours of footage, there are some entertaining deleted and extended scenes (35:26) in this presentation that definitely assists in filling your cravings for more. Add in audio commentary by Kevin Macdonald and editor Joe Walker which is informative, especially the process of linking it all together plus promo spots (13:56), a stop motion featurette entitled Life in a Day Stop Frame (1:20) and my favourite, Ridley Scott on Life in a Day (1:47), it's great that the distributors of this film have actually gone to some effort in this department. In the end, Life in a Day is a touching and mesmerising documentary about humanity at its most vulnerable, most powerful and how we fit into the bigger picture. At its essence, we are all connected and McDonald successfully highlights this in the presentation that will make you laugh, cry and have all your emotional heartstrings pulled.